Extend Valley Metro Rail to downtown Mesa. On August 22, the Central Mesa light rail extension began service connecting riders with downtown Mesa. Valley Metro and city of Mesa hosted station celebrations at the four new stations located on Main Street at Alma School Road, Country Club Drive, Center Street and Mesa Drive. Residents across the Valley came out to also enjoy live music, food, activities to discovering the new destinations that are now just a train ride away. Seven months ahead of schedule and on budget, the additional 3.1-miles of service on Main Street between Sycamore Drive and Mesa Drive was greeted with big cheers from riders, business owners and local leaders. 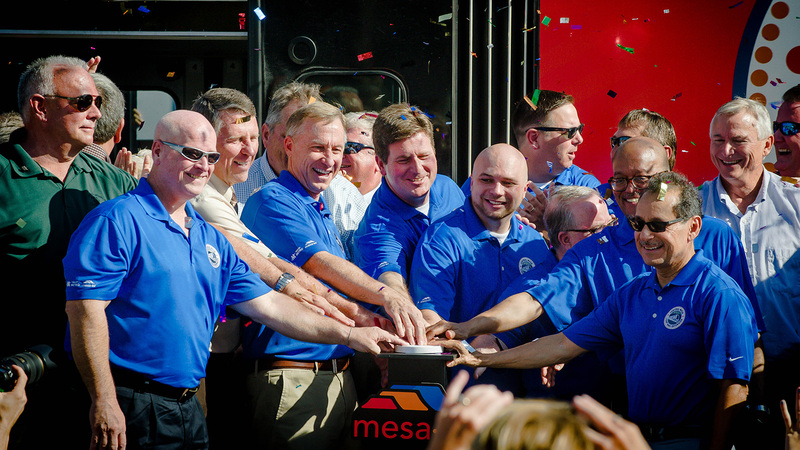 Valley Metro and its contractor, Valley Transit Constructors, began construction of the Central Mesa light rail extension in summer 2012. More than 700 jobs were generated annually during the project’s peak construction. Funding of the extension was provided by a $75 million grant from the Federal Transit Administration, as well as $71 million in countywide transportation tax funds and $53 million in federal air quality funds.